Rural Nigerieans face grinding poverty on a daily basis. 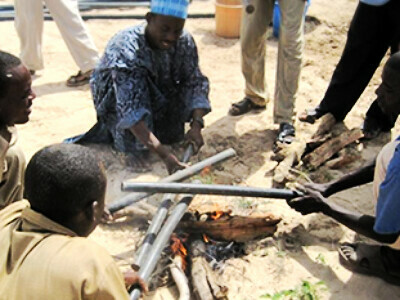 In 2012, Niger ranked last in the world on the UNDP Human Development Index of 186 countries. Water-related challenges drive poverty in this arid country where the distribution of water resources and rainfall patterns are highly variable and where little storage or distribution infrastructure exists to mitigate climatic conditions, especially in poorer regions. Even in good agricultural production years 25% of the population is considered food insecure, reaching crisis proportions during frequent drought periods. Up to 60% of the rural population has no access to improved water supply, and 94% are without improved sanitation. Water quality is also a major concern due to the high incidence of open defecation, high density of cattle, and shallow water tables in some parts of the country. 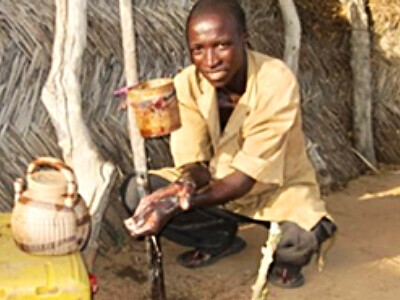 In the Zinder region, communities depend on unimproved hand-dug wells for all of their water needs. Over 50% of children under five suffer from chronic malnutrition, and more than 20% die before their fifth birthday, in large part due to water-related diseases. Improved agricultural methods help small-scale farmers grow high-value horticultural crops. Ali Maman is one farmer who has expanded his production from low-value crops like sugar cane into cabbage, tomatoes and peppers. Treadle pumps are a high-demand low-cost irrigation technology that allows farmers to grow high-value horticulture crops year-round. Business development training helps them with advertising and promotion in their communities. Village savings and loans associations support growing and new livelihoods ventures, including improving water services. Women work together to transplant crops in their women's garden. With technical training and better water access, their fields are becoming more productive and lucrative. A community health agent facilitates an awareness session, covering several topics around hygiene, sanitation and nutrition. 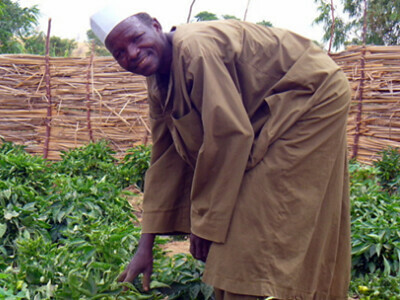 A community establishes a nursery in Barago, Zinder, Niger. Winrock social mobilizers train community MUS representatives on hygiene. A community health agent facilitates a hygiene awareness session during a tour through rural Niger. Sessions are informational but fun, including drama sessions performed by community health agents. In many rural communities throughout Zinder, households depend on contaminated water from shallow wells. Rope pumps are a popular, cost-effective way to access clean water that are supported by a network of mechanics and locally available spare parts. Women participate in a community clean up day - an activity that was motivated by the provision of better and more accessible water services. A small girl demonstrates the use of her families tippy-tap to wash her hands. A community completes a transect walk of their neighborhood as part of the Community-Led Total Sanitation (CLTS) initiative. Members of the Hadîn Kai (Cohesion) Women’s Group of the Edoh village in the Bande commune during a VSLA meeting for payment/deposit. Groups like these help women access the funds they need to pay for water service improvements and expand livelihoods activities. Students of Biri elementary school hold up a “Thank you" sign, thanking the Winrock team for all the activities they carried out in their village: which include four community rope pumps and building women's and school gardens. Increase community resilience and reduce poverty with an integrated approach to water service provision, targeting smaller communities that are a low priority for government support. A community-driven participatory planning process identifies priority water needs and available sources. A range of investments in infrastructure and management systems increase the quantity, quality and sustainability of water supply for drinking, food production, and income generation. Infrastructure investments include manually drilled boreholes fitted with locally-fabricated pumps, upgrades to existing traditional wells and garden wells. Locally manufactured, low-cost pumps and water recharge technologies are developed and tested, including the training of small-scale, private entrepreneurs to provide services, technologies and spare parts along the entire water supply value chain. Health-enhancing activities include hygiene behavior change and promotion of low-cost technologies. Livelihoods training in market gardening and low-cost technologies such as tube wells and treadle pumps are provided to convert small family gardens into year-round sources of income, increasing overall agricultural productivity. Community training in the operation and maintenance of water service infrastructure, the promotion of women’s participation and leadership in water point management, and the strengthening of the local private sector supply chain all help ensure sustainability of services. Community training in the operation and maintenance of infrastructure helps ensure sustainability of services, including promoting women’s participation and leadership. A holistic focus on climatic, environmental, and economic “resiliency” is key. Market-based small business development to supply affordable and desirable technologies and services can be critical to MUS success. Low-cost, appropriate technologies support high uptake and sustainability. Significant synergistic benefits in governance capacity, community solidarity and empowerment of women can emerge in integrated MUS programs.